I just began playing trumpet a year ago, and always thinking how to make sure we rest as much as we play, and not falling into playing a phrase in 2 minutes straight and end the practice in frustration. A few days ago, I decide to make an app just for this. This will detect when we play (or do something loud), then trigger a timer set to the duration of the phrase we play. When the timer set off, the program will make a beep. Upon this, we can start another phrase! It is in .apk format for now, for testing. 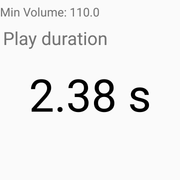 Improved timing and working with metronome. Tested with my Samsung J5 and Xiaomi 4. -The rest time is now very close to the play time but not exactly equal (due to my inexperience with programming). I want it to be more accurate. I don't see the need. I get tired. I take a break. Good for you for making something. Maybe there are people out there who will use it. I think they spend too much time worrying about stuff, but I'm not politically correct. Well, not everyone needs it really, especially seasoned ones, who know well their own limit. I think this is a great idea! I downloaded it and had trouble getting it installed though. let me know if you have any trouble with installing. I guess it might be useful for some, but do we really need an app for this? Nah, some ppl find it helpful, some dont. I can definitely see an app with 10 features will eventually become distractive, just like running apps todays. Thank you I will implement it as an option in settings. I usually let the screen off and listen to the beep, instead of fixing on the timer. On my Android phone, phase one is significantly longer than phase two. It should include a total timer so we can see how much we practice on a given day. And if you want to get fancy, you can keep track of the days. Ah, fancy is exactly what I want to avoid the idea is it is just another practice tool like the metronome, something non-intrusive. Sorry, I dont have a MAC to make one for iPhone, but I can share the code for anyone interested. Not so much on exercises, but sometimes I wear headphones and wail away with an album and get carried away, or keep skipping back to get some part down, and then I can blow myself out, it needs a loud alarm! When practicing etudes, such as Clarke second study, I found years ago that it was helpful to count out a rest between phrases that was about the same number of beats used to play it. Helpful because something happens during that small rest period, especially during a warmup. This was a little suggestion from a very well known teacher who pointed out that there was a fermata over the double bar at the end of each line, which was intended to tell the player to take just a mini rest after playing each phrase. I tried it, but not believing that it would be all that helpful. To my surprise, this almost "nothing" suggestion did facilitate playing of the entire set of etudes with better mouthpiece feel, sound, focus, and much less fatigue. I think the fingers benefitted as well. I don't think I need an app to count 16 beats, however. Just sharing my personal experience regarding the benefits of taking small rests during your practice session. I found the same benefits in practicing Schlossberg and Caruso studies as well.